Just a year after unveiling an all-new, radically-revamped GL1800 Gold Wing and buoyed by public demand, Honda are now to bring in a second variant... for over £5000 less! The new bike will line-up alongside the high-specification Gold Wing Tour and Tour DCT versions and will be available at 13 specialist dealers (see below). The existing Tour models are both equipped with large top-boxes and heftier price tags to boot, with the new machine acting as a more svelte, minimalist and arguably cooler-looking Wing, which replaces the old F6B. 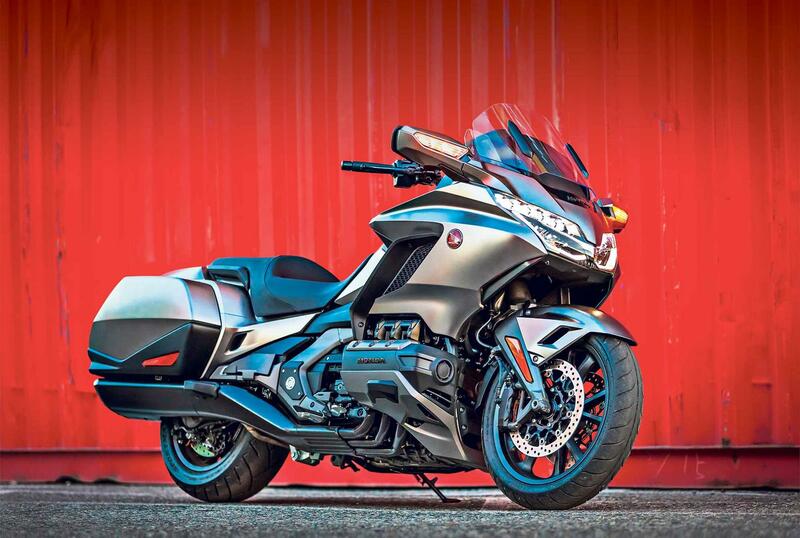 Essentially, the new standard Gold Wing is, like the old F6B, the familiar full-dresser but without rear top box/back-rest (plus built-in speakers) for a more slimmed-down, blacked-out, 'bagger' look. There’s also a matching, shorter screen, it does without a main stand and there’s no DCT option. On the plus side there’s the same, super-smooth, 1833cc six-cylinder powerplant giving over 124bhp and 125ftlb of torque, the same sleek aerodynamic bodywork, redesigned chassis and double-wishbone front suspension system. Unlike some slimmed-down versions of tourers from other brands, you still get all the Wing’s electronic goodies, too. That means ride-by-wire throttle, modes, traction control, keyless ignition, full LED lights plus a fabulous infotainment system that has music, maps, Bluetooth and Apple CarPlay. In fact, the only things you lose by giving the Tour pack a miss is 50 litres of luggage space, 40kg of extra weight and a nice back rest for the passenger. But what you gain, by stripping all that back, is a tourer with an extra dash of style; the perfect companion for a weekend away.